This capsule hotel is located in one of the main streets of Kabuki-cho, the nightlife area of Shinjuku, a few minutes on foot from Shinjuku station. It is very difficult to find a position where to stay better than this one, a normal hotel in that area costs at least three times this capsule hotel, the only cheaper option are internet cafes. This capsule hotel is also located in Kabuki-cho, a few minutes on foot from Shinjuku station. It is the first capsule hotel ever opened in Tokyo, inside it has a very beautiful public baths with jacuzzi and sauna. If you stay more than one day, they keep your bags during the day for free. Only for male guests. This capsule hotel is located a few minutes on foot west of Ikebukuro station, a very lively area. It offers many services like an inner restaurant, massage service, sauna. This capsule hotel has quite cheap rates, it is located in a great position in Shinsaibashi area, just a short walk from Amerikamura and Namba, the most popular areas of Osaka. Moreover, it is very "gaijin friendly", they're accustomed to have foreign guests. This capsule hotel is located in Shinsaibashi too, in a very convenient position, and costs even less than the Asahi Plaza. The best capsule hotel in Umeda area, a few minutes on foot from Umeda station and 1 km far from Osaka station, it is also one of the cheapest. Capsule hotels are a typical kind of hotel that can be found only in Japanese cities, the first hotel of this kind opened in Osaka in 1979 and since then they have spread to major cities in Japan, even if something similar opened in China and Korea too in recent years. The "rooms" that these hotels offer are such as coffins (sorry if this seems macabre, but they make me feel this bad impression), no more than 2 feet long where you lie down to sleep. 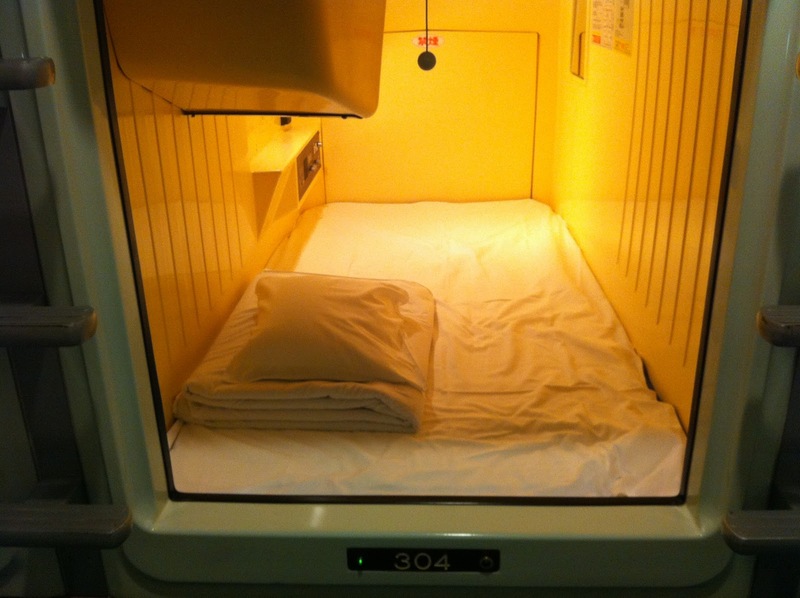 Photos definitely make a better idea of what capsule hotels are. 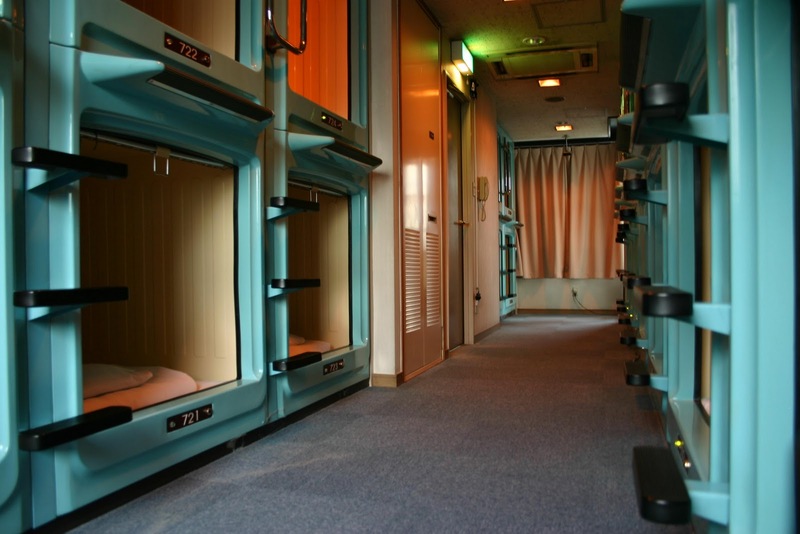 The interior of these "capsules" of all capsule hotels is generally equipped with television/radio, alarm clock, often heating/air conditioning. What differentiates one capsule hotel from another are the external services they offer. In alla capsule hotels you can find lockers where to drop your bags, bathrooms, showers, vending machines. Some better ones offer many other services as pajamas, wireless, internet terminals, saunas, shared japanese style bathroom (ofuro), massages, washing machines, possibility to order food. This type of hotel is used mainly by the same users of internet cafes, namely the famous salarymen coming out too late from work and missing the last train back home, who instead of spending a fortune on taxis, they stop to sleep outside and come back the next day to work (or home at the weekend). Also for this reason most capsule hotels offer facilities such as printers, fax, or other more unusual ones like vending machines of socks and ties. Generally, capsule hotels are for men only, unless the capsule hotel has floors for women only too, so check this point if you are a woman. Capsule hotels with floors for women were once almost nonexistent, but in recent times are spreading. Reservations are not necessary, they usually always have free rooms. I recommend this option to: all those who travel alone, don't have a high budget, and want to get as much contact as possible with the Japanese urban society. I don't recommend this option to: if you aren't traveling alone, the economic aspect often becomes irrelevant (except for some particularly cheap capsule hotels), in fact each one of you should pay a single capsule, but maybe you could find a double room in a small hotel for the same total price. If you are two or more is even more uncomfortable, there is no reason to choose this accommodation, unless you want to go there on purpose to do this "experience".